The Pearl of Christian Comfort is a dialogue between Petrus Dathenus and Lady Elizabeth de Grave. It is based upon letters Dathenus wrote to Elizabeth in 1584 that were later collected and published in 1624. Dathenus is more mature in the Christian faith and in this dialogue graciously explains to Elizabeth how to rightly distinguish between law and gospel and to find comfort in the work of Christ. Those familiar with the Heidelberg Catechism will find many echoes of it throughout this wonderful little book. My goal is to highlight some quotes from this gem. To set the context, Elizabeth confesses faith in Christ but finds herself with heaviness of heart due to her failures. “First of all, I feel that I am one of those who knows Gods will but does not do it (Luke 12:47). Therefore I can only expect to be afflicted with many stripes. After all, the Bible says plainly that all those who have sinned under the law will be judged by the law; for not those who hear the law but those who do the law will be justified (Rom. 2:12-13).” p. 5 (See a related post on Romans 2:13 and the Covenant of Works). While it may seem unfair that the law commands perfect obedience, Dathenus in his counsel wisely directs Elizabeth to consider Adam, being created upright in the Garden. He writes, “The law had its beginning when God created Adam in His image and implanted His law in Adams heart. The law of God was there then, as the image of God in which Adam was created, made as Paul says, in true righteousness and holiness.” Elizabeth acknowledges “…Adam was created to rightly know and love his Creator, to obey Him and to do good to his neighbor in love.” Both here are echoing Heidelberg Catechism Q/A 6. 6. Did God create man thus, wicked and perverse? No, but God created man good and after His own image, that is, in righteousness and true holiness, that he might rightly know God his Creator, heartily love Him, and live with Him in eternal blessedness, to praise and glorify Him. Dathenus then draws out the distinction between Adam’s moral ability prior to the fall and our inability in our post fall condition to obey God perfectly as he has commanded. Once Dathenus has laid the initial groundwork of the law, the discussion ensues regarding the Gospel. The Greek word for gospel denotes joyful good news which causes people to speak and sing joyfully and be glad in heart, just like the good news that came to Israel that David had triumphed over the arrogant Goliath and slain him (1 Sam. 18:6). 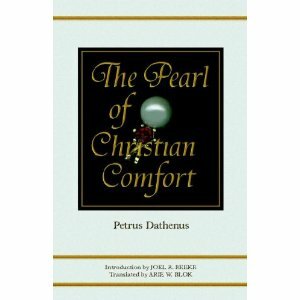 The Pearl of Christian Comfort by Petrus Dathenus is available through Reformation Heritage Books.